Milinda Ajawara is a NY6 Think Tank “Next Generation” humanities contributor who worked on a project that focused on Women’s Studies (also known as Women’s and Gender Studies). Her project consisted of a series of interviews with Hamilton College students and faculty members of all genders. The interviews explored their knowledge of women’s and gender studies in academia and their opinion on whether or not the discipline has any impact on society. 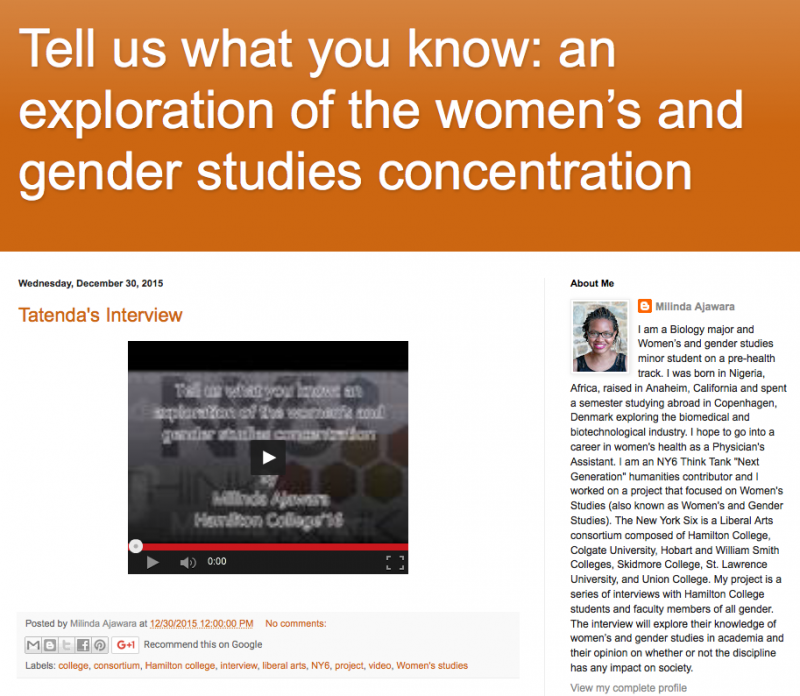 Milinda is a Biology major and Women’s and gender studies minor student on a pre-health track. She was born in Nigeria, Africa, raised in Anaheim, California and spent a semester studying abroad in Copenhagen, Denmark exploring the biomedical and biotechnological industry. She hopes to go into a career in women’s health as a Physician’s Assistant.